Natural aging and a lifetime of involuntary facial muscle actions contribute to the formation of wrinkles, creases and lines that can make you look angry, tired or older than you feel. Although aging may be inevitable, Miami Skin and Vein possesses an unprecedented arsenal of gentle, non-surgical treatments that combat the most noticeable and frustrating facial imperfections. BOTOX® has become the most commonly performed non-surgical treatments to address these types of issues. Recognized as an Allergan Platinum Level Injector, Dr. Shaun Patel offers an unparalleled level of expertise in BOTOX injections that you won’t find at other clinics or med spas. To learn more about how BOTOX can help you, please contact us today online or at 786-618-5039 to schedule a consultation with Dr. Patel. Our state-of-the-art facility in Coral Gables welcomes patients from Fort Lauderdale and Miami, Florida. Why choose Miami Skin and Vein? BOTOX Cosmetic was approved by the Food and Drug Administration (FDA) in 2002 for the cosmetic reduction of forehead lines and has successfully been used to treat a wide range of other conditions, such as wrinkles on the neck and gummy smiles. BOTOX is a purified version of Botulinum Toxin Type A. It has been proven to reduce the effects of facial aging, such as crow’s feet, frown lines and other complexion issues. When injected into the skin, BOTOX temporarily paralyzes the facial muscles that contribute to wrinkles. BOTOX is designed to soften wrinkles caused by the muscular activity of your face. Your facial muscles move when you make certain expressions and over time, this muscle movement creates wrinkles where the skin folds together. BOTOX works by blocking signals from the nerves to the muscles. When the injected muscle is unable to contract, wrinkles relax and soften. Using a tiny needle, Dr. Patel injects BOTOX into the muscles below the targeted area. The procedure is quick and requires no surgery or downtime. The injections themselves are relatively painless. Some patients experience minor discomfort at the injection site, but this is only a temporary effect that quickly subsides. 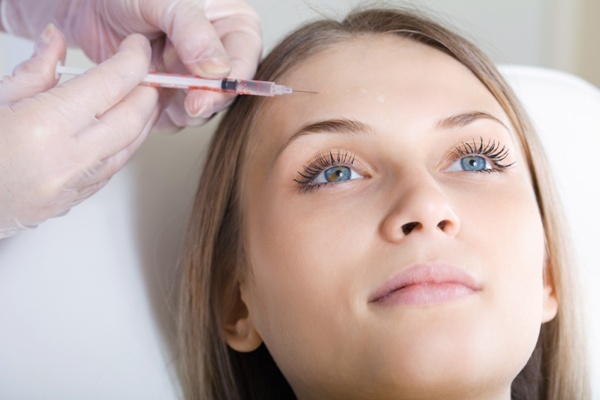 What Issues Can BOTOX Injections Address? Targeted injections of BOTOX into facial tissue can temporarily interrupt the nerve signals to nearby muscles. By diminishing muscle activity, BOTOX can correct fine lines and deep set wrinkles. See our wrinkle relaxer before & after gallery! Your masseter muscle is one of the more powerful muscles in your body. The masseter wraps around your jaw bone, working to open and close your jaw when you eat and speak. When this muscle enlarges, it can change the shape of your lower face, sometimes dramatically. Masseter enlargement is typically caused by chronic teeth grinding and the unconscious clenching of your jaw. Masseter issues are often accompanied by uncontrolled jaw spasms. BOTOX® has been successfully used to treat this condition by relaxing the overworked muscle. When the muscle is relaxed, it can return to a more pleasing shape and size, restoring your natural facial contours. Your vertical neck muscles, known as platysma bands, are continuously pulling down on your lower face. Over time, this muscle action can cause you to lose definition in your jawline. The Nefertiti Lift – named after the Egyptian queen known for her beauty – is a technique that restores definition using BOTOX®. 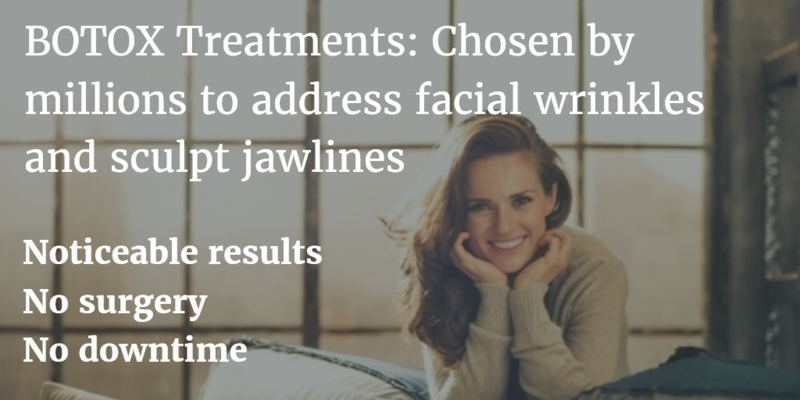 BOTOX® injections are strategically administered along your jawline and into your overworked neck bands. When these muscles stop pulling your features down, you will likely notice an improvement in the definition of your jaw. Amount of BOTOX used: Generally speaking, the more units of BOTOX that are injected into a region, the longer the results will last. Muscle strength: If you have very strong facial muscles in a certain area, they may be more resistant to the paralyzing function of the treatment. As a result, more BOTOX may be required to achieve the same duration of results. 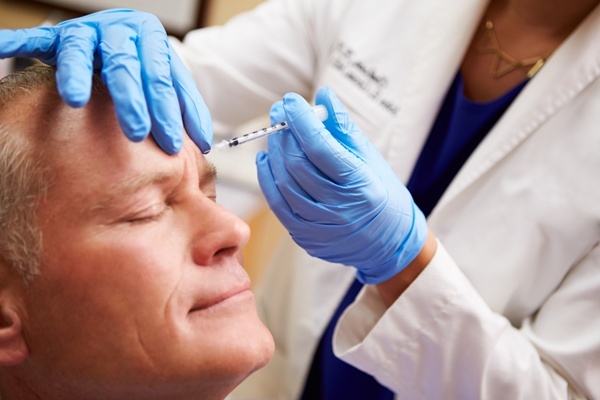 Follow up treatment: With follow-up BOTOX injection treatments at Miami Skin and Vein, it is possible for your results to last even longer than the average three to four months. Some patients can enjoy results for up to six to eight months with consistent follow-up schedules. During your initial consultation, Dr. Patel will perform a comprehensive facial examination that thoroughly evaluates the shape of your face, the presence of wrinkles and lines as well as the overall texture of your skin. He will discuss your facial evaluation with you in front of a mirror and determine the role of BOTOX Cosmetic in your treatment. A key component of this examination is confirming that the wrinkles of concern are the result of muscle activity and not volume loss or other issues. Depending on the nature of your wrinkles, Dr. Patel may suggest other modalities of treatment, such as dermal fillers. Dysport: Dysport also contains the Type A botulinum used in BOTOX. It has been used to successfully treat the appearance of wrinkles as well as some neurological disorders. Like BOTOX, Dysport diminishes facial wrinkles by relaxing the muscles underneath. Xeomin: Much like BOTOX and Dysport, Xeomin is a botulinum Type A product that is used to temporarily relax facial muscles and minimize wrinkles. Xeomin is similar to BOTOX and Dysport in that results appear quickly and last for a similar amount of time. A key difference is that the manufacturers of Xeomin claim that the product does not contain any additives, so there is less risk of developing an antibody to the injectable that blocks its response. Dr. Patel strives to meet the unique needs of every patient. This dedication to individualized care includes a variety of treatment options to meet the specific needs and preferences of each patient who visits. During your consultation, Dr. Patel will thoroughly explain all of your options to help you make an informed decision about your care. The American Society of Plastic Surgeons estimates that 57 percent all BOTOX and Dysport patients are between the ages of 40 and 54. Twenty-three percent of recipients were 55 years of age or older, while people between 30 and 39-years old made up 18 percent. Only 1 percent of these patients were between the ages of 20-29. Not all twenty-somethings will benefit from BOTOX, but some may find value in its ability to prevent the formation of wrinkles and fine lines. Early injections may also make it possible to reduce the frequency of injections needed later in life. Why Choose Dr. Patel for Your BOTOX Treatment? Dr. Patel has extensive experience in providing facial injections. He is recognized by Allergen, the makers of BOTOX, as a Platinum Level Provider. He has treated thousands of patients and dedicated thousands of hours perfecting his technique to correct a number of facial issues and asymmetries. Patient education is a cornerstone of Dr. Patel’s philosophy of care. Many patients visit Miami Skin and Vein seeking a specific treatment without realizing all of their options and alternatives. Depending on your situation and goals, Dr. Patel may recommend additional or alternative treatments to help you achieve the appearance you desire. Whether he recommends injectable fillers or chemical peels to help address your aesthetic goals, you can rest assured that he always holds your best interests at heart and will never recommend a procedure that is not right for you. You will never feel rushed or pressured into making a decision. Your face and decisions belong to you. Dr. Patel is here to help. The average patient may receive anywhere between 10-40 units of BOTOX. This amount varies and depends greatly on how many areas you want to treat, as well as the strength of the muscles in the targeted areas. During your consultation, Dr. Patel will discuss the number of units needed to match your specific goals and explain how much you can expect your treatment to cost. If you would like to learn if you are a good candidate for BOTOX facial rejuvenation, please call Miami Skin and Vein today at 786-618-5039 to schedule an initial consultation with Dr. Patel. We proudly welcome patients from Coral Gables, Fort Lauderdale and Miami, Florida. Botox Pre and Post Treatment Instructions by Dr. Patel for his patients.